← Lame Adventure 171: Everything’s under control, we’re high! Shortly after I arrived at work on Wednesday, Greg, my sidekick, told me that he just heard on the radio that Elizabeth Taylor had died. I waited about an hour before casually mentioning it to Ling and our boss, Elsbeth. Neither of them knew and both felt a twinge of sadness for the passing of this Hollywood legend. 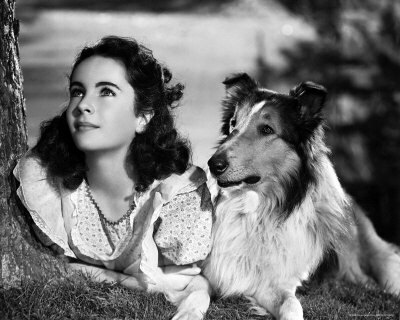 12-year-old Liz with the original Lassie in 1944. The only others I would be inclined to tell would be Milton and Coco. In the case of Coco, one of her minions is a chap that’s so gay, he is practically the rainbow flag on feet. I deduced that he was a likely source of spreading this news her way. If not, she doesn’t live under a rock so she could have easily figured it out for herself a million other ways from taking a glance at CNN on her iPhone or overhearing someone talking about it at work since her desk is right next to the bathroom. It seemed highly likely that when someone was not asphyxiating her with a heavy finger on the Oust, she could just have easily overheard someone talking about this event. Therefore, instinct told me that Coco knowing was not a problem. Yet Milton … That had potential problem written all over it. Me: You didn’t know that [insert name of dead person] died? Milton: No, I didn’t. You did? Milton: Where was I? How did I miss that? It’s simple. I read the obits. Milton doesn’t. Me: I’m not into that band. I have no idea who that guy is. I later learned that he did the guitar solo in their hit 25 or 6 to 4. This is not from my 45 collection. I have no idea what that song is about. 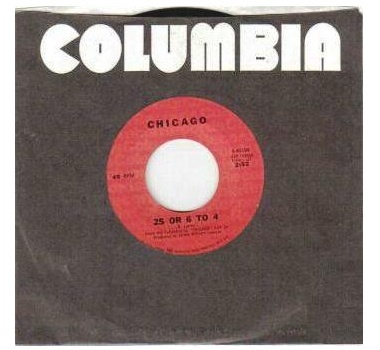 I have never owned a Chicago record in my life. Yet, I knew that Liz Taylor checking out would be monumental to Milton, but I was hoping that somehow he’d find out through someone else or Facebook. After a few hours I forwarded him her obit in The New York Times and by then everyone else he knew had contacted him. I felt immense relief. Milton: It was so small; it couldn’t even fit Diana Ross’s luggage. Me: It was a propeller plane, right? Milton: It was a propeller plane! Me: Albee told me that. Milton: Albee knew I would be flying on a propeller plane and you didn’t tell me! Me: He told me I shouldn’t tell you because then you’d probably cancel your trip. Milton: Yes, I would have canceled had I known I would be flying in a propeller plane! Thanks to Albee urging me to keep the bad news about Milton’s first flight a secret, coupled with Milton surviving that flight, Milton has a new appreciation for jets and might actually fly again in less than fifteen years. Maybe he’ll even fly to wherever Liz is buried to eat a donut in her honor at her grave. As Joan Rivers once quipped about Liz’s frequently high weight once she reached her middle years,”Is Elizabeth Taylor fat? Her favorite food is seconds.” On Wednesday, Joan was Tweeting about feeling as lousy as the rest of us knowing that Liz is gone. This entry was posted in Humor and tagged chicago, elizabeth taylor, fear of flying, joan rivers, lassie. Bookmark the permalink.